When you search for places offer car window tint services in the Holmdel, NJ area, you should check how much they charge for each window. Smaller cars have around five windows, excluding the windshield. Larger vehicles like sedans and SUVs have around seven to ten auto glass. The total window tinting price for a regular-sized car can cost at most $500 depending on the type of film you wish to use. In order to find best window tint film, you should consider what you want for your car. Not all tints are made equal. There are some that last longer, such as the hybrid film and carbon window tint film. Others such as the dyed film tend to fade and wear out faster. Some films like the metallized tints are also more efficient in blocking off UV rays, so they are more expensive than the regular films. The pricing of a window film is also affected by the type of vehicle that you have. Some cars are harder to tint, so you can also expect to pay more. This is why when you call a company about tint pricing, they will ask you about the vehicle you use. Looking for the Best Car Window Tint Service Near Holmdel, NJ? 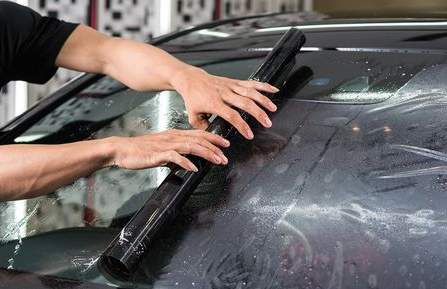 AutoWorks is an automotive electronics shop that also offers car window tint services to towns in the Monmouth County area. Service towns include: Middletown, Tinton Falls, Oceanport, Keyport, Keansburg, Highlands, Matawan, Long Branch, Hazlet, Atlantic Highlands, Aberdeen, Shrewsbury Twp, West Long Branch, Fair Haven, and many more. To learn more about our products and installation services, contact us today at 732-671-0225 or visit the website.